A Congressman throughout his four-decade-long career as a politician, Mr Thanhawla had told the media after being sworn-in as chief minister in December 2013 that he would not contest in 2018 as he turns 80. 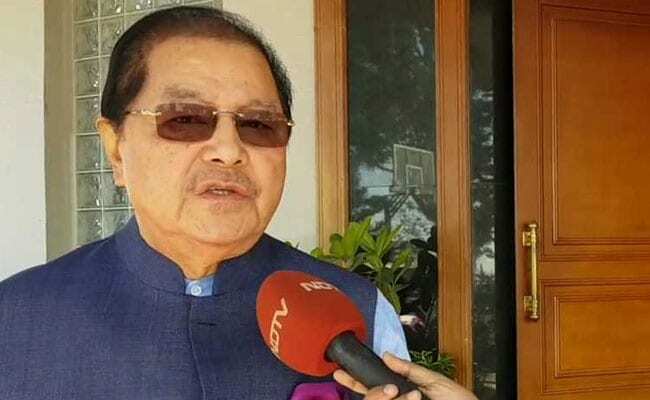 Congress stalwart and five-time Mizoram chief minister Lal Thanhawla, who won all state assembly polls barring one since statehood, wanted to step aside this time but contested from two seats to ensure his re-entry to the House. But facing a combative Mizo National Front (MNF) and threats from the Bharatiya Janata Party (BJP), which was seeking to increase its presence in the northeast, he contested from his home turf of Serchhip and from Champai South seat on the Mizoram-Myanmar border in the November 28 polls to enter the house for a record 10th time. Mr Thanhawla, who is among the longest serving politicians in the state, was the first leader of opposition after Mizoram attained statehood in 1987 when Laldenga, the first chief minister of Mizaoram, was at the helm of the government. But there was mid-term election as Mr Laldenga's ministry was toppled after 19 months followed by Centre's rule. Assembly polls were held in 1989 and the Congress, which had forged an alliance with the MNF (Democratic), won it and Mr Thanawla became the chief minister. This was, however, his second term in office as he had been the chief minister in 1984 but had resigned to pave the way for implementation of the Mizoram Accord on June 30, 1986. He was then sworn-in as deputy chief minister under the erstwhile underground Mizo National Front (MNF) supremo Laldenga. He was re-elected in 1993 by forging alliance with the Mizoram Janata Dal (MJD) led by former chief minister Brigadier Sailo and went on to be in power for the third time. The Congress lost the state assembly polls in 1998 to the MNF led by Zoramthanga, and Mr Thanhawla lost his home turf to retired engineer K Thangzuala. He was out of the state legislature for five years. He was re-elected in 2003 from Serchhip and became the Leader of the Opposition. Under him, the Congress swept the assembly poll in 2008 winning 32 of the 40 seats and he became the chief minister for the fourth time. That time he had won two seats - South Tuipui and his home turf Serchhip. In 2013, the Congress bettered its 2008 result by winning 34 seats. Mr Thanhawla was elected from Hrangturzo and Serchhip seats and he assumed office for the fifth time. In 2017, his second-in-command and then home minister R Lalzirliana announced that the Congress will contest the 2018 state assembly polls under Mr Thanhawla. Mr Lalzirliana parted ways with Mr Thanhawla and resigned from the cabinet in September, just two months before the polls. He contested on a MNF ticket from Tawi in Aizawl district. Born on May 19, 1938, Mr Thanhawla is an arts graduate. He was elected to the Mizoram legislature for the first time in 1978 as an independent nominee from Champhai constituency on the Mizoram-Burma border. He was among independents who had contested the assembly poll that year under the banner of Mizoram Congress Committee (MCC) due to the split in the Congress at the Centre in 1978. Mr Thanhawla was leader of the group and the MCC rejoined the Congress in 1979. When Mizoram went to polls in 1979 after a brief spell of President's Rule due to internal squabbles in the People's Conference government led by Brig Thenphunga Sailo, Mr Thanhawla was again elected as leader of the opposition.